It’s a fair question because, for most people, it’s the second language they’re learning after their native tongue. And let’s be honest, who really remembers how long it took to learn our first language? With that said, knowing how long it takes to learn Mandarin can help you understand how far along you are during your journey. Think about climbing a mountain and knowing what part of the mountain you’re in versus being completely clueless about your location. To answer the question itself, we have to distinguish the difference between the ‘Official’ answer and the ‘actual’ answer. Here’s what we mean. First off, how long does it take to learn the Chinese characters? Potentially years. Mandarin doesn’t have any real alphabets. This means that compared to other languages we’ve written about, like Spanish, French, and German, Mandarin is a different beast. The next factor to consider is proficiency levels. According to the U.S Department of State, there are five levels of language proficiency. The first level is elementary proficiency, which is knowing the most basic words to travel short-term with the ability to navigate around safely. Asking questions like, ‘how do I go to the washroom’ or ‘where is ….’ is the extent of your Mandarin skills. The second level is ‘Limited Working Proficiency’ where you can hold a short and basic conversation, and understand a limited amount of text. For people learning Mandarin for business, level three is the minimum proficiency you want to reach: ‘Minimum Professional Proficiency.’ This is when you can speak with sufficient structural accuracy and have comfortable informal conversations with native speakers. This is when you can speak with sufficient structural accuracy and have comfortable informal conversations with native speakers. In fact, this is the level that most people want to reach. Our belief is that you’ll start to see a diminishing return on your time when you get near level 4. Level 4 is ‘Full Professional Proficiency’ where you can understand 90% of what native speakers are saying. Then as you can imagine, level 5 is when you’re fully native and bilingual. How long does each level take? It turns out that it takes 2,200 class hours to learn Mandarin for English speakers. If you put the rest of your life on hold and focused only on studying Chinese – at 5 hours of practice a day, it would take you 88 weeks. Now, we would argue that this information is pretty limited. Why? Because it’s assuming that you’re required to take traditional language classes to learn Mandarin, which is not the most effective way to learn a language. In addition, it doesn’t have any information about what proficiency level you will reach once you put in 2,200 class hours. Will you be Level 1 fluent? Or will you become a fluent bilingual speaker after this time? Have you already tried learning Mandarin in the past? If you’ve previously learned Mandarin before, you’ll have a much easier time relearning the language. Even if you completely forgot how to speak Mandarin. Psychologists have shown through ‘The Forgetting Curve‘ that there is information stored in on our long-term memory system that we can recover again, even after 10 years. All this means is that you’ll be able to learn much quicker if you’ve previously been taught Mandarin. What language method are you using to learn Mandarin? How you’re actually learning Mandarin will determine how quickly you can learn Mandarin. Makes sense right? It’s no different than trying to get in shape. If you’re solely relying on a mobile fitness app to get fit, you’re not going to get very far in a short span of time. On the other hand, if you decided to hire a private fitness coach who can keep you accountable and customize a roadmap for you, do you think you’ll get results faster? 100%! There is a popular study done by the National Training Laboratories, which outlines how the human brain retains information. We only remember 20% of what we hear and read (i.e. lectures, audio programs), while we remember up to 90% of what we say and do. This is why when it comes to learning a new language, practicing with a native speaker will give you far greater results than learning through a traditional textbook or a classroom. How fluent do you want to be in Mandarin? Last but not least, you have to look internally at your own goals. What does being fluent mean to you? Are you looking to be fluent enough to do business in Mandarin? Or are you simply looking to learn the basics to order at a restaurant, and navigate yourself safely in China? The word ‘fluent’ can be too broad and general in the language world, and our advice is to define what it means for you. Once you can define this clearly, you’ll have a much better idea of how long it will take you to learn Mandarin. Now we’ll share some tips on how you can increase your learning speed in Mandarin. There are numerous tactics and strategies that are shared online on how to learn Mandarin faster. But we’re going to narrow it down to the 3 most effective tips (in our opinion). Multiple research studies from top linguists show that some words are more valuable than others. More specifically, the most common Mandarin words are the where you can get the best bang for your buck. It turns out that by understanding 2,000 of the most common words in your target language, you’ll familiarize yourself with around 80% of the language. If you double the number of common words in your vocabulary, you’ll only see a gain of 10% proficiency. That means there’s a diminishing return on your time after a certain point, which will vary based on how fluent you’re looking to get. We think 1,500 to 2,00 words should be your ideal target. Here are 80 of the most common words in Mandarin you can check out. 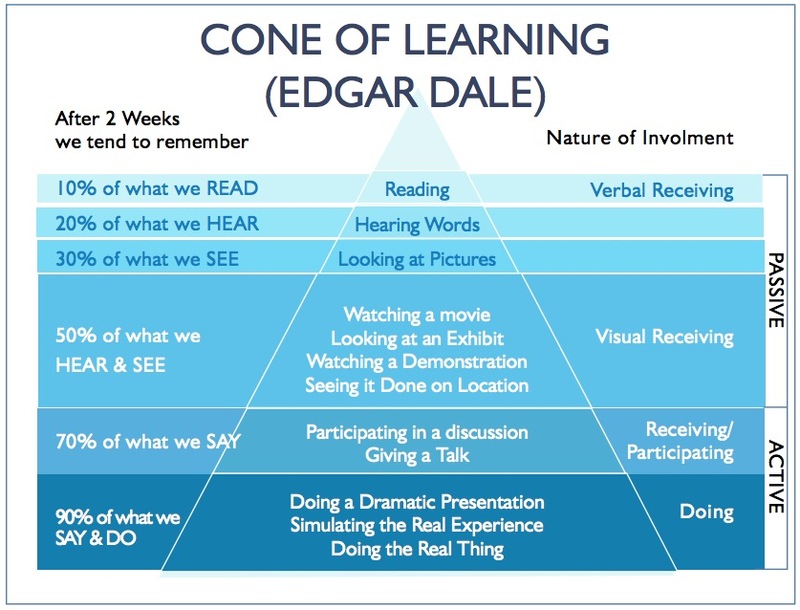 As we shared previously, the most effective way to remember for information is by saying and doing (refer to our Learning Pyramid diagram above). Practicing with a native Mandarin speaker will allow you to do this in real-time while getting immediate feedback to improve your skills faster. Too often we see students who have the basic understanding of grammar structures, wide vocabulary knowledge, and good listening skills. But they can barely get a word out in Mandarin when it matters most! You can seek out a friend who already speaks Chinese or if you’re busy, you can check out Rype, where we handpick professional teachers for you to learn from. The two tips we share above won’t be effective if you don’t take action regularly, for a long period of time. Like anything we want to learn or accomplish, building the habit of taking lessons and practicing your skills is the ultimate foundation you need to establish. The first step is to make the first 30 days count. The early days of learning anything is often the hardest part, so start with bite-sized learning times and make it a daily habit if possible. We recommend checking our post on How to Create a New Language Learning Habit That Sticks. In conclusion: How long does it take to learn Mandarin? We hope our tips above were useful for speeding up your learning. While we shared with you the official answer of how long it takes to learn Mandarin, there is no real answer to this question. Instead of focusing on how long it will take, we recommend to just start taking smart action today. No matter how small, the momentum you gain from starting will take you much further than wondering the length of your journey. Just focus on the work, have fun while you learn, and you’ll get to your desired fluency level over time.